Chronic endometritis is a persistent inflammation of the endometrial mucosa caused by bacterial pathogens. Although chronic endometritis can be asymptomatic, it is found in up to 40% of infertile patients and is responsible for repeated implantation failure and recurrent miscarriage. Diagnosis of chronic endometritis is based on hysteroscopy of the uterine cavity, endometrial biopsy with plasma cells being identified histologically, while specific treatment is determined based on microbial culture. However, not all microorganisms implicated are easily or readily cultured needing a turnaround time of up to one week. 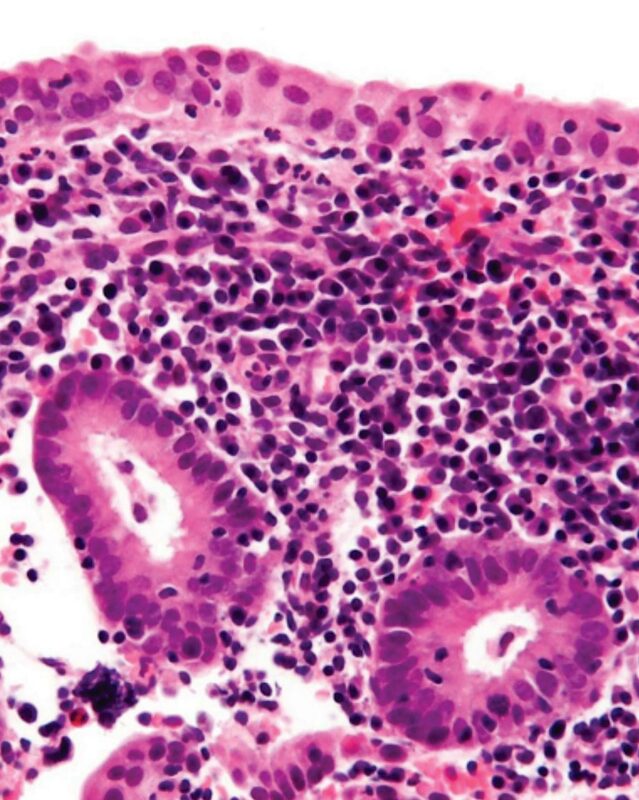 Image: A histological micrograph showing endometrium with abundant plasma cells, which are diagnostic for chronic endometritis and scattered neutrophils (Photo courtesy of Nephron). A team of international scientists working with those at Stanford University (Stanford, CA, USA) assessed endometrial samples from 113 patients assessed for chronic endometritis using at least one or several conventional diagnostic methods namely histology, hysteroscopy, and/or microbial culture. 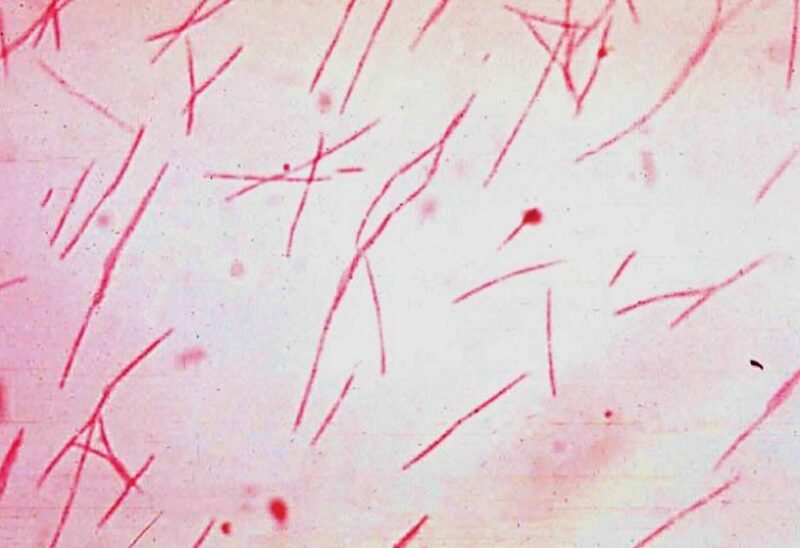 These samples were evaluated by reverse transcription polymerase chain reaction (RT-PCR) for the presence of nine chronic endometritis pathogens: Chlamydia trachomatis, Enterococcus, Escherichia coli, Gardnerella vaginalis, Klebsiella pneumoniae, Mycoplasma hominis, Neisseria gonorrhoeae, Staphylococcus, and Streptococcus. The sensitivity and specificity of the molecular analysis versus the classical diagnostic techniques were compared in the 65 patients assessed by all three-recognized classical methods. The molecular method showed concordant results with histological diagnosis in 30 samples (14 double positive and 16 double negative) with a matching accuracy of 46.2%. Concordance of molecular and hysteroscopic diagnosis was observed in 38 samples (37 double positive and one double negative), with an accuracy of 58.5%. When the molecular method was compared to microbial culture, concordance was present in 37 samples (22 double positive and 15 double negative), a matching rate of 56.9%. When cases of potential contamination and/or non-cultivable bacteria were considered, the accuracy increased to 66.2%. Of these 65 patients, only 27 patients had consistent histological plus hysteroscopic diagnosis revealing a 58.6% of non-concordant results. Only 13 out of 65 patients (20%) had consistent histology plus hysteroscopy plus microbial culture results. In these cases, the molecular microbiology matched in 10 cases showing a diagnostic accuracy of 76.9%. The molecular microbiology confirmed over half of the isolated pathogens and provided additional detection of non-culturable microorganisms. In the endometrial samples with concordant histology plus hysteroscopy plus microbial culture results, the molecular microbiology diagnosis demonstrates 75% sensitivity, 100% specificity, 100% positive and 25% negative predictive values, 0% false positive and 25% false negative rates. The authors concluded that the molecular microbiology method is a fast, and inexpensive diagnostic tool that allows for the identification of culturable and non-culturable endometrial pathogens associated with chronic endometritis. The results obtained were similar to all three classical diagnostic methods together with a degree of concordance of 76.9% providing an opportunity to improve the clinical management of infertile patients with a risk of suffering from this ghost endometrial pathology. The study was published on February 22, 2018, in the American Journal of Obstetrics and Gynecology.